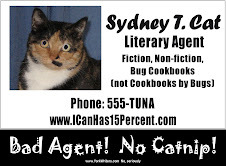 The official blog of the world's worst (maybe) literary agent, Sydney T. Cat. Because ANYBODY can print up some cards and call themselves an agent. Even a cat. And if it isn't prohibited, then IT IS REQUIRED! Home - Info - Sydney's Story - About Sydney's People - FAQ - Store - Become a Client - Adopt a Writer-cat! Sydney does not like to do work. Submitting client's manuscripts: HARD! Cut into Sydney's nap time! But Sydney has time-tested Bad Agent technique to keep nasty work under control. Is called "Extrapolation." Here, I show you how work. "Sorry. This is a great read and lots of fun, but left-handed pirate books aren't working for us right now. Right-handed privateers are more the rage right now. The writing is wonderful though, and we'd love to see more from this author." 1. Nobody at this house will buy anything with left-handed pirates. 1b. Or left handed protagonists. 2. Nobody at ANY house will buy anything with left-handed pirates. 2b. Or left handed protagonists. 3. Also client cannot sell, and Sydney should give up on them (not really the subject of this post). So, anytime Sydney gets manuscript from ANY client with left-handed pirate, or pirate, or left-handed protagonist, or this client, is waste of Sydney's time and energy to send out. Goes in "ignore" pile to be professionally ignored for duration of emergency. This goes on, possibly for years, until that big left-handed pirate book that all the teenage girls love comes out, stays at top of Times list for six months. THEN Sydney send out (except for stuff from that worthless client), creating glut just in time to watch trend fizzle. Then can start sending out letters, "nobody buys left-handed pirate, or pirate, or left-handed books any more" again. This may not seem smart, lose Sydney money. But Sydney is not trend setter. Setting trends is work. Bad Agent Sydney wants to hear from YOU! Please leave your queries, questions, or comments! Perhaps Sydney's response will inspire a future post! While Bad Agent Sydney is not taking on new clients at this time, she is well aware that ALL WRITERS NEED CAT SUPERVISION! Little known fact that this instinctive talent that ALL cats have! Writers (and everyone want to be writer! ), do to local shelter and ADOPT HOMELESS KITTY TODAY! Use this LINK to find shelter near you! GO! AGENT SYDNEY SAYS! If you found this post useful or fun, please be aware that Sydney has NEEDS! Toys. Catnip. TUNA! Support Sydney (and her people) by digging deep and sending a "thank-you" donantion her way. PURRRRRRRRRRRRRRRRRRRRRRRRRRR! (You cannot resist my hypnotic "pay up!" purr! PURRRRRRRRRRRRRRRRRRRRRRRRRRRRRRRR! Clients, perhaps you have noticed that your advances has been getting smaller! This is not Sydney's problem, and you is not Sydney's only client! Sydney is not about individual advances! Fifteen (wait, twenty!) percent of your advance is not much for Sydney, but this is okay! Sydney is about quantity, not quality! Fifteen percent (no, twenty!) of a lot of crappy advances will keep Bad Agent Sydney in the tunas! Bad Agent Sydney wants to hear from YOU! Please leave your queries, questions, or comments! Perhaps Sydney's response will inspire a future post! While Bad Agent Sydney is not taking on new clients at this time, she is well aware that ALL WRITERS NEED CAT SUPERVISION! Little known fact that this instinctive talent that ALL cats have! Writers (and everyone want to be writer! ), do to local shelter and ADOPT HOMELESS KITTY TODAY! Use this LINK to find shelter near you! GO! AGENT SYDNEY SAYS! If you found this post useful or fun, please be aware that Sydney has NEEDS! Toys. Catnip. TUNA! Support Sydney (and her people) by digging deep and sending a "thank-you" donantion her way. PURRRRRRRRRRRRRRRRRRRRRRRRRRR! (You cannot resist my hypnotic "pay up!" purr! PURRRRRRRRRRRRRRRRRRRRRRRRRRRRRRRR! Sydney's Collected Wisdom NOW IN PORTABLE EBOOK FORM! 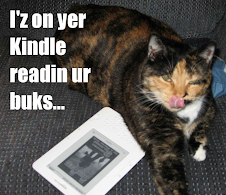 Sydney Says, "BUY MY BOOK! I NEEDS TUNAS! BUY ME TUNA! BUY THIS BOOK! Buy Sydney's people's books so they buy Sydney TUNA! DO! NOW! EVEN IF STUPID DOG ON COVER! Who is Bad Agent Sydney? Visit the Bad Agent Sydney Store! Tee shirts, hats, (yum!) mouse pads, and more!